The U.S. Patent and Trademark Office on Tuesday granted Apple a patent for an advanced journaling system that timestamps and geotags any iOS device event, such as a phone call, an app download, the playing of a song, and more. 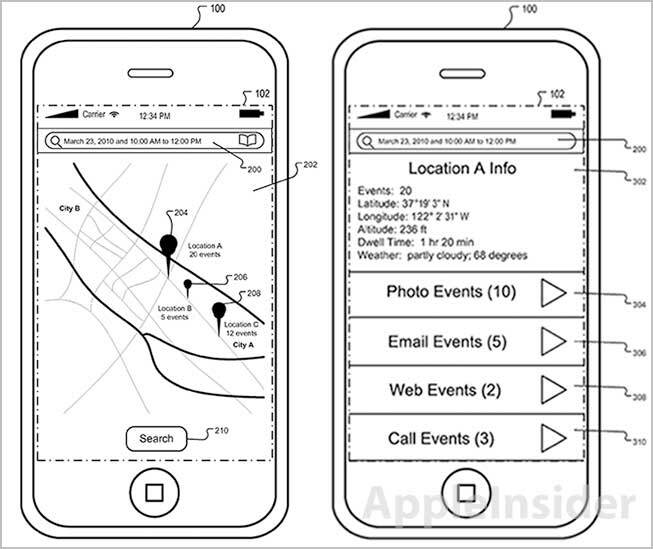 Much like the existing geotagging feature seen in the iOS Photos app, the system presented in Apple's U.S. Patent No. 8,316,046 automatically notes an event's time and location, but goes further in logging basically any set of device data. 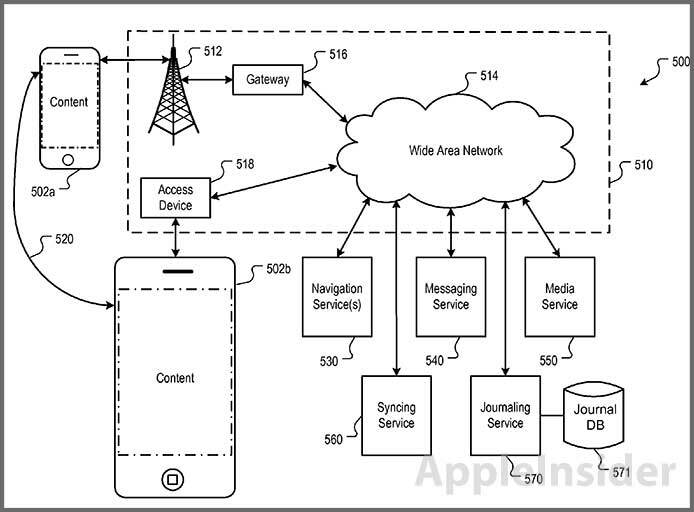 The '046 patent utilizes a map as a means to display the aggregated data, using special icons and tags to differentiate different events such as phone calls or app downloads. The map GUI pulls from a timeline created and stored in a database, which is searchable via text entry. For example, a user can type in "Mar. 23, 2010 and 10:00 AM to 12:00 PM and email," which would return a set of data for emails sent or received on Mar. 23 between 10 a.m. and noon. Note that the system allows for the use of Boolean operators such as "to" and "and." The aggregated data can be filtered by time, location, application, and other methods to offer a comprehensive but presentable display of the database. Also called for is a UI in which the user can adjust the subsystem's settings, customizing which events are logged and for what time period. In some implementations, the system can offload storage of the event database to a server, which is then accessed by the device through a Wi-Fi or cellular network. Illustration of device storing and accessing event data from off-site database. Of the numerous "event data" the journaling subsystem can handle are network connections, radio broadcasts, application data such as opening or closing an app, device charging times, attachment of an external device, and more. Because the can be accessed by client applications through an Application Programming Interface (API), almost any high function event can be logged. Similar products exist in the app store, such as Evernote, which give users the option of tagging notes and other items, however iOS has yet to offer such system-wide functionality. It remains to be seen whether the feature will make its way to a future iteration of Apple's mobile OS, however the invention could prove to be useful as users become increasingly reliant on information stored in their portable devices.